On the latest episode of Reel Shorts, guest critic, Cynthia Fuchs of PopMatters looks at the action crime film, Gangster Squad. That treat will be, very literally, the entrails of the lesser gangster, who is immediately and brutally murdered in this brief introductory scene. But the poor man’s suffering is not the point here. Rather, it Cohen’s many excesses, his outsized ego, his grand gestures, his big putty (or putty-like) nose. Penn makes it all extra-huge, perversely comic, and not a little disconcerting. And for that, you might feel moderately grateful. 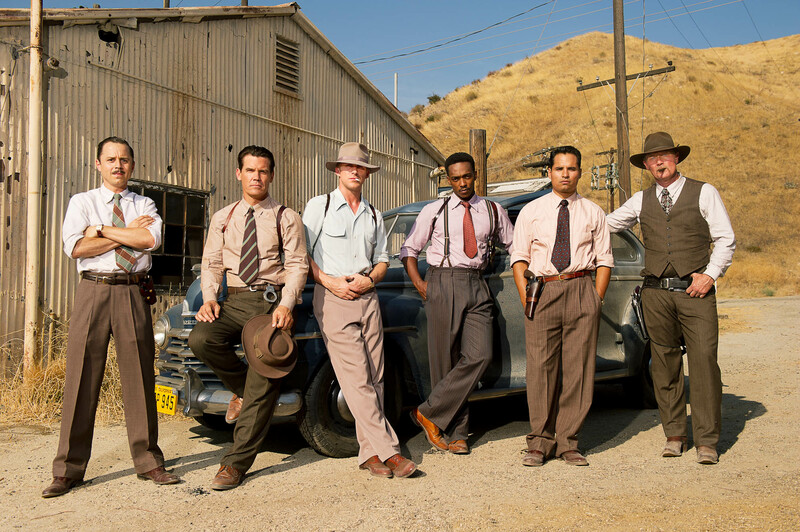 For the rest of Gangster Squad is a hackneyed mess, the squad members a bunch of LA cops who are too corny to generate much concern, their fates sealed by the clichés they carry. That’s not to say that the move gets the period wrong, exactly, or misrepresents the ways gangsters and cops behaved. Life magazine’s spread of photos showing Mickey Cohen lounging with his wife in sunny California suggest he had his own corny sense of how to self-represent and felt confident enough that media and consumers went along with whatever fantasy he was offering. Still, the combination of sensationalism and banality in Gangster Squad is something else, namely, a movie that includes a credit line for “Milk Skinned Blonde” (played by a young woman and likely aspiring person named Ambyr Childers). As his first scene implies, Cohen is the primary-big-fat target for the squad, initiated by LAPD chief William H. Parker (a frighteningly beat-down facsimile of Nick Nolte), who’s sick and tired of the bad guys running his town. Accompanied in most scenes by his driver, one young and whippersnappery Daryl Gates (Josh Pence)—who will, of course, mature into the monstrous patriarch of the ethical and legal abuses known as CRASH and Rampart (subjects of other, generally better movies)—Parker recruits the ultra-upright Sgt. John O’Mara (Josh Brolin). In turn, this WWII veteran recruits an unbelievably one-from-every-food-group team, including a black one (Anthony Mackie as a uni named Harris, mad that heroin is ruining the streets on his beat), a Hispanic one (Michael Peña as Navidad Ramirez, who tags along with the aging sharpshooter, Hopalong, played by Robert Patrick), and a nerd named Keeler (Giovanni Ribisi), also a war vet and “he best wire man in the department,” as you learn from O’Mara’s decidedly un-hardboiled narrating. The third vet on board is Wooters (Ryan Gosling), cynical since his return, just looking to get by and make a quick buck. For a minute, the premise is full of possibilities, that the men who’ve been to war now see the world differently, and lament the short-sightedness of the over-consuming twits running around with newfangled multi-shot weapons. But the movie doesn’t follow through on that idea. Instead, Gangster Squad goes for rote plotting: O’Mara’s a standard issue hero. And Wooters’ about to be one, moved to join the team by the murder of a shoeshine he knows, one of those dead meat characters who exist to motivate the leads into action. This slow motion death scene—during a hit on someone else on the sidewalk outside the blandly deco-ish nightclub Slapsy Maxie’s—is another one of those excessive moments, grinding on for long moments when you know where it’s going before anyone inside the story, apparently. That also makes it one of those moments that makes you wish you were watching a smarter movie, one that knew you had seen this scene before, in a thousand other movies.